As a SAHM I love to Create, Cook, and especially Cherish memories my family, friends and I make. I dabble in many things and that is what I will share in my blogs. Life, Love, Family, Children, Cooking, Crafting, Travel, Photography, Reviews and Much More. I hope you enjoy. This is my life! 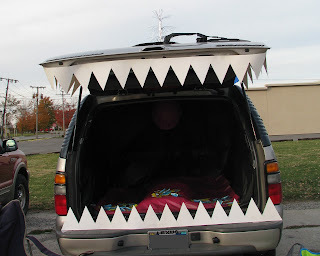 I was really excited this year to find out that our church was having Trunk or Treat 2 days being Halloween. 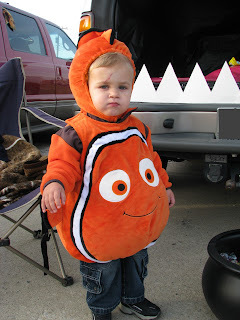 It meant that my family could decorate our trunk and still go trick or treating with our son and friends. 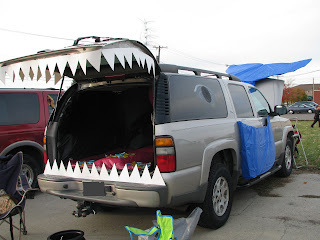 How should I decorate our Suburban. What should we dress as. I am a theme person by nature. My home is decorated around a "theme". I love throwing "theme" parties. When I plan Halloween costumes I prefer "themes". So on paper I decided I would decorate the vehicle to look like a Whale! My hubby would be Jonah, my son a fish, and myself Pinocchio. I was sooo excited. I started planning how I would create everything. For the Tail I used two pillows covered in garbage bags in case of rain on the hood of the truck. Then topped the pillows with a cardboard cutout all covered in plastic blue tablecloths. The side pectoral fin is also a cardboard cutout covered in plastic blue tablecloth. The end of which I folded to fit inside the door when it was shut. This made it easy to open the front doors of the vehicle because I could move the fin out of the way. The actual "trunk" I cut out teeth and taped them together using poster board. I then taped them to the back of the vehicle. It is a little hard to see but the inside was covered in a black plastic tablecloths, one red on the bottom using two pillows to create the tongue and a balloon covered in a bag as the Uvula. 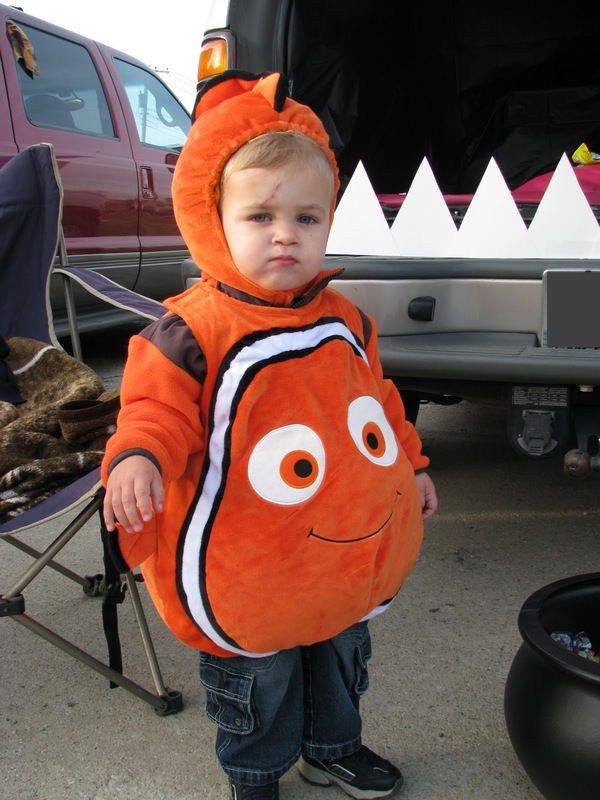 On top of the tongue were little bags of Swedish fish and Nemo fruit snacks. On the top of the truck were two fountain silver decorations stacked together to look like the spout. To finish the look I added an eye to each side. 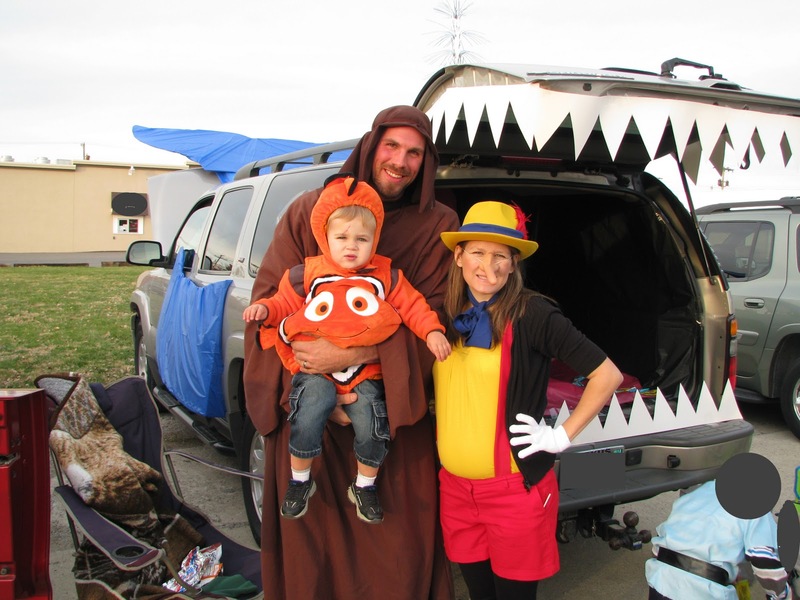 We had a really great time passing out all the candy and seeing all the "Trunk or Treaters". Cole had the most fun eating all the candy! I found this through pinterest. What a *fabulous* idea!! So clever. Thanks for sharing. Pumpkin Creme Pie Recipe Review! The exciting and dreaded first haircut.